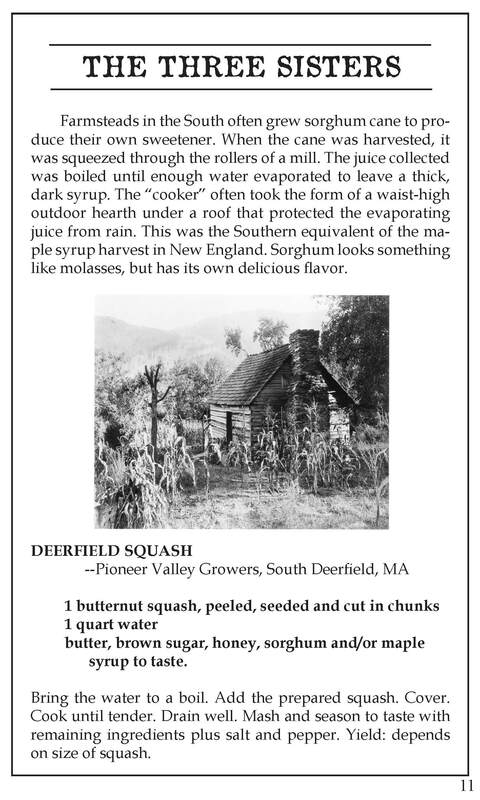 Step into our log cabin village and sample some authentic pioneer cooking! 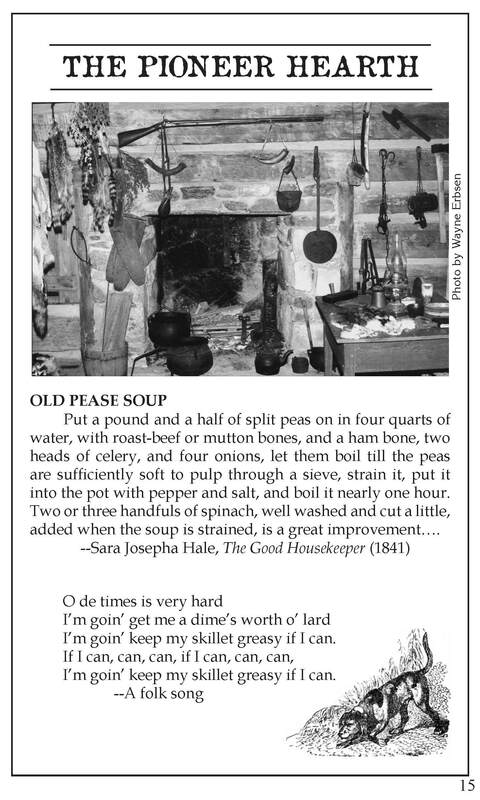 From New England to Texas, from the Appalachians to Pike’s Peak, pioneer cooks had to be tough and self-sufficient–able to whip up hearty meals with little more than an iron pot and a sharp knife. Recipes range from Chisholm Trail Chili to Appalachian Stack Cake and Grandma Cody’s Applesauce Cookies. If pioneer life has left you bruised and battered, we’ve included some curious remedies and questionable cure-alls. This book is loaded with captivating snippets of information, recipes, vintage art and photos and much more! 5 1/2″ x 8 1/2″, 168 pages. Recipes: Jamestown Pottage, Snow Cabbage, Palatable Frittters, Best Pork & Beans, Pecos Pintos, Pedernales River Chili, Succotash, Martha Washington’s Rum Punch, Raspberry Shrub, Switchell, Apple Johnny Cake, Basic Biscuits & Variations, Boston Brown Bread, Crackling Bread, Fitzpatrick House Crullers, Homemade Crackers, Narcissa’s Camp Bread, 24 Scandinavian Flatbread, Sharon Ryan’s Whole Wheat Bread, Soft Pretzels, Tea Biscuits, Fried Cornmeal Mush, Indian Pudding, Indian Slapjack, Red Flannel Hash ,Rye Cakes Scrapple, A Rice Pudding, Amish Whoopie Pies, Apple Stack Cake, Burnt Jeremiah Syrup, Excellent Pie Crust, Faye Smiddy’s Fried Apple Pies, Grandmother Anderson’s Sour Cream Raisin Pie, Grandmother Cody’s Applesauce Cookies, Ice Cream in a Can, Laura Ingalls Wilder’s Gingerbread, Old Fashioned Molasses Cookies , Old Fashioned Pound Cake, Orange Syrup, Oregon Trail Apple Treat, Molasses Pudding, Scripture Cake, Simmon’s Pompkin Pie Sugar Cookies, Sweet Potato Pie, Sweet Potato Pudding, To Make Cherry Tarts, Vanilla Sauce, White Frosting, Apple Indian Pudding, Apple Shortcake, Apple Snow, Gooseberry Fool, Minted Berries, Pickled Peaches, Steamed Cranberry Pudding, A Mess of Greens, Buttered Parsnips, Butternut Squash Gratinm Deerfield Squash, Leather Britches Beans, Palatable Fritters, Parched Corn , Pickled Beets. Poke Greens., Purslane Salad, Roasted Beet Salad, Roasted Potato Salad, Rosemary Roasted Potatoes, Salsify with Cream Sauce, Sauerkraut with Apple, Scout Potatoe, Snow Cabbage, Very Nice Dressing for Cabbage, Beef Tea, Cough Medicine, For the Tooth-Ache, For Weak Ankles, Sprained Ankles, Herbs for Soups & Sauces, Rice Jelly, Vinegars for the Sickroom, Witch Hazel Extract , Beaf Jerkey, Byrd’s Ham, Carolina Country Style, Cassereau, Great Humped Back Roast Pork & Apple Dinner, Rabbit Saut, Salt Codfish, Sara Smith’s Buffalo Gravy, Sausage Gravy, Sweet Potato & Possum, To Make Sausage Meat, Virginia Baked Ham. Pickles, Preserves & Jellies Apple Butter, Chow Chow, Mushroom Ketchup, Watermelon Preserves, Wild Cherry Jelly, A Stew Pie, Basic (Missouri) Stew, Beef Stew, Brunswick Stew, Buttermilk Dumplings, Conner Prairie Pumpkin Soup, Georgia-Style Brunswick Stew, Jamestown Pottage, Old Pease Soup, Rum Tum Tiddy, Seminole Stew, Shaker Pea Soup, St. Jacob’s Soup (Utah), Stewed Catfish, Velvet Chicken Soup. 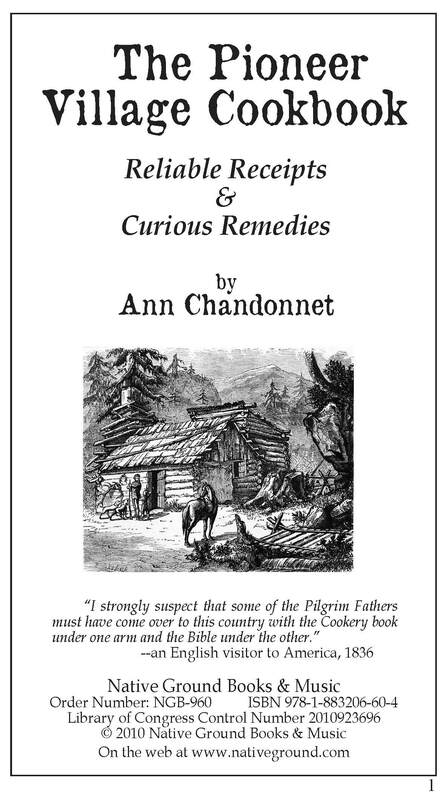 Charming illustrated with vintage woodcuts and the occasional black-and-white photo, Ann Chandonnet’s “The Pioneer Village Cookbook” offers 168 pages of culinary and folk medicine nostalgia drawn from our pioneer forebears. 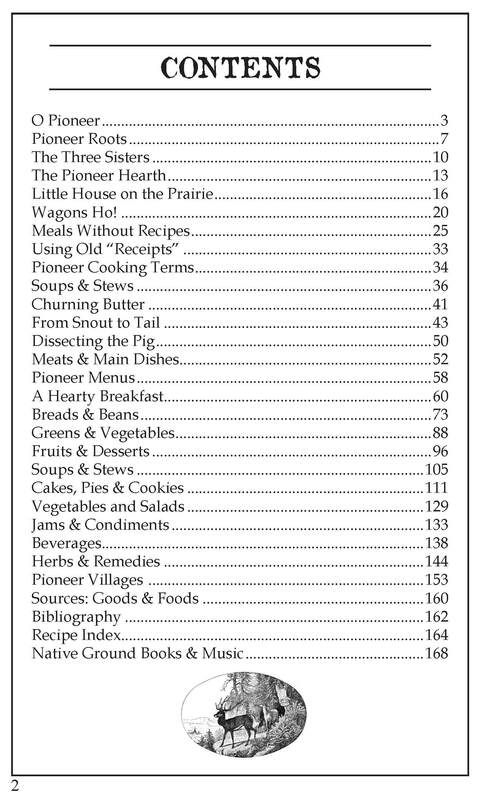 Offering commentary rich with historical perspective and context, “The Pioneer Village Cookbook” is a compendium of 17th and 19th century wisdom born of necessity when kitchen cooks from the Appalachians, to the New England States, to the Texas prairies had little more than the basics of a knife and cooking pot. Of special note is the section on ‘Hearty Breakfast’ with dishes ranging from Indian Slapjack, to Hasty Pudding, to Red Flannel Hash, and more! 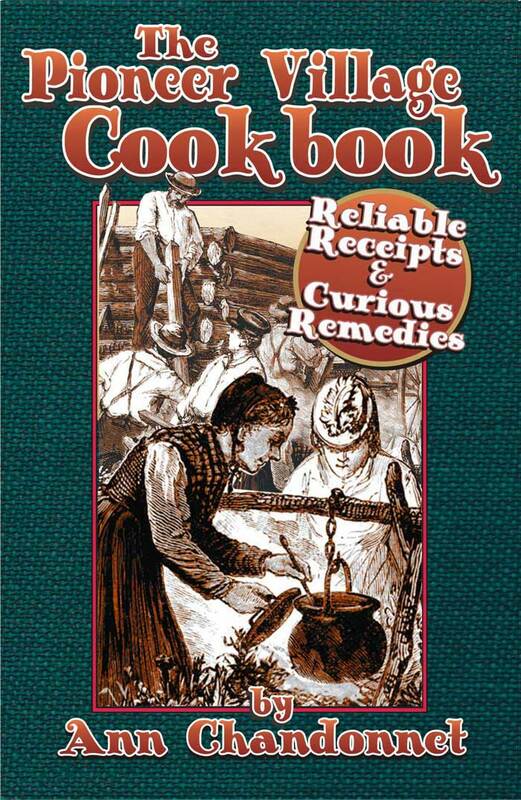 A fascinating and informative read, and offering a wealth of truly ‘down home’ cooking, “The Pioneer Village Cookbook” is a highly recommended addition to academic library American Folk Medicine reference collections, as well as personal, family, and community library cookbook shelves.